June | 2015 | Love Those "Hands at Home"
After their really bold escape and three weeks of lurking in the daunting Adirondack wilderness, one of the escaped convicts was shot and killed a few days ago and, yesterday, the other was shot and captured. And the best part of all? No one else was hurt, not one member of the many law enforcement teams, not one innocent citizen, no one! Let normal summer activities resume! 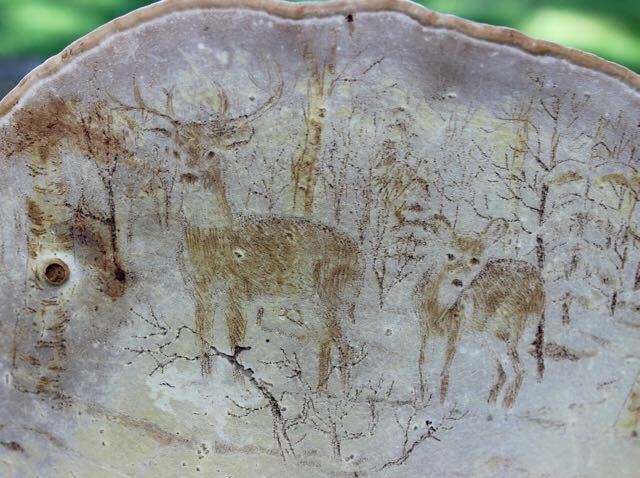 These deer remind me, a little, of photographs I’ve seen of ancient cave paintings, made by humans more primitive than we, who were driven by their need or desire to make a mark. If you are creative, do you see every blank surface as a canvas, on which to make your mark? Does a plain piece of paper call to you, for the scratching of your pen or the wash of color from your brush? If you see a piece of fabric, do your fingers itch to embellish it, to add color and designs? If you have string, do you need to weave it or braid it or knit it? I love when makers make with the materials at hand, simply because they are compelled to create, to make their mark. Men who spent time in the woods picked up knives and pieces of wood and whittled, pulling expressive shapes out of nothingness. 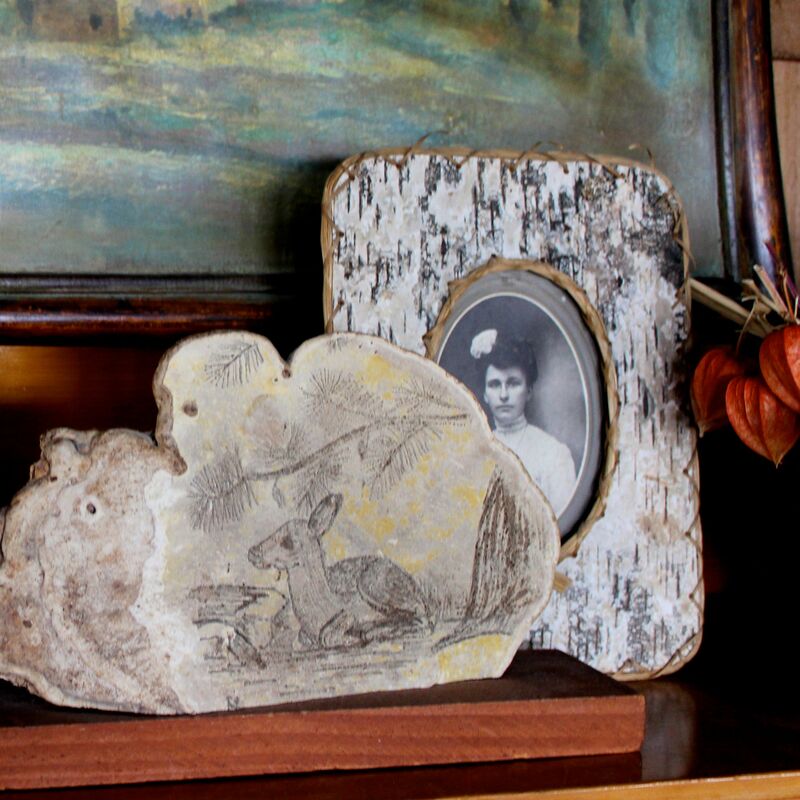 Sailors passed the time at sea scratching intricate designs into whalebone, turning the blank surface into memories of a voyage and things of beauty. Blank canvases are everywhere, to those who seek them. It comes as no surprise that at least a few people who live in the Adirondacks have been unable to resist the impulse to decorate the blank surface of the huge tree fungi, Ganoderma applanatum, that grow on dead and dying trees in the forests. 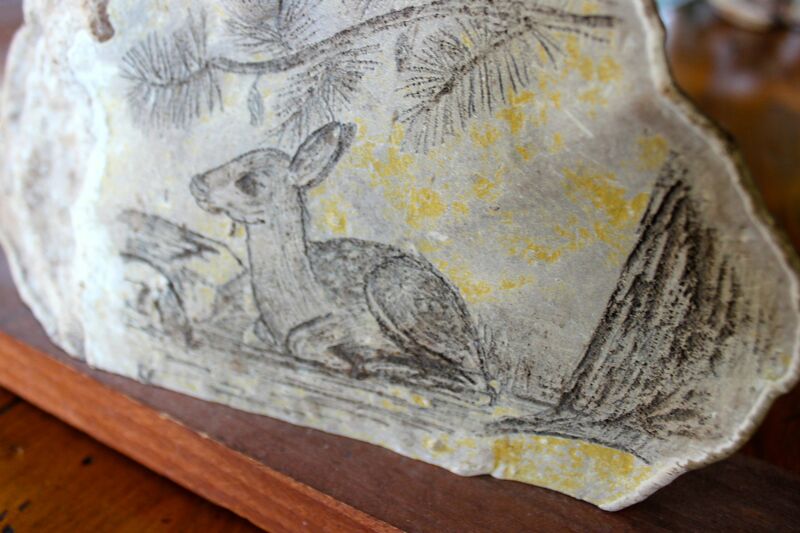 I’ve written about fungus art before but recently added a new example to my tiny collection. I got my pretty fungus at, yes, a garage sale. The people who sold it to me told me it was done by a man named Herb Newlove, who was an art teacher and assistant principal at a local school. 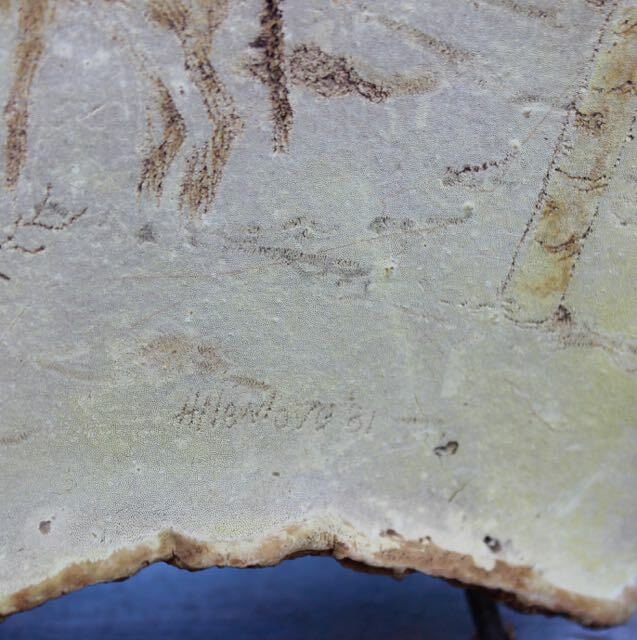 With that information, when I looked at the piece, I could just make out his tiny, faint signature and the date 1981. Mr. Newlove has since died but he lives on in this little treasure. This seems to me to be one of the best things about making, the tangible work that outlasts the maker and allows the maker to achieve a sort of immortality. When I think of Mr. Newlove or Harriett, for that matter, I realize that I feel I know them, that they are real to me because I know their work. This piece works so well for what it is. This is a woodland scene, with two deer taking a close look at the viewer. We wouldn’t expect to see Disney characters or Pop Art in this medium! The design is very faint and subtle, giving the impression that the deer are peering at us through a misty morning. 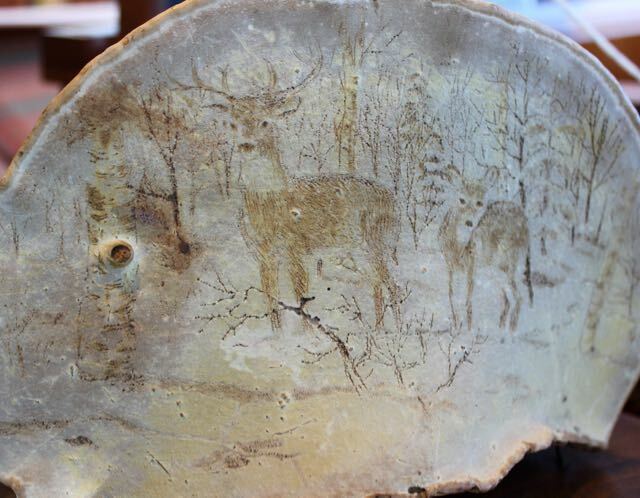 The artist would’ve used pointed tools to scratch and stipple his design into the soft surface of the fungus, a surface that has hardened over time to preserve the work done. The work is nuanced and expert, much more so than the work in my other deer fungus. The very light touch used by the artist and the difficulty of making out the design invite us to look harder and longer, and the time spent is rewarded. The compulsion that those who came before us felt—the cave dwellers in Altimira and Lascaux, Harriett, Mr. Newlove—is no different than what you and I feel, and it seems to be part of what makes us human. We use the materials at hand to make a mark, we make our mark, a mark no one else could ever make, and a part of us never dies. The shuttles continue to fly! Our excellent niece will be attending the University of Vermont in the fall, where the school colors are green and gold. She will be the only student wearing this particular scarf! 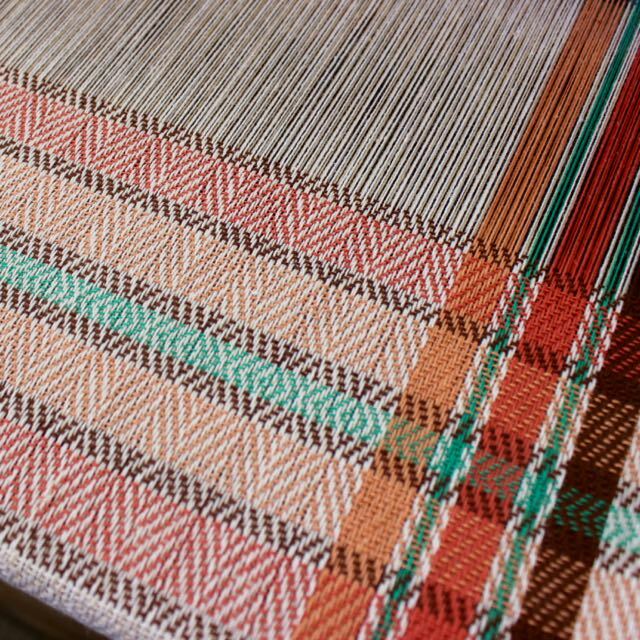 This weaving pattern is called herringbone plaid and I love how I could make transitions from stripes to the plaid section. 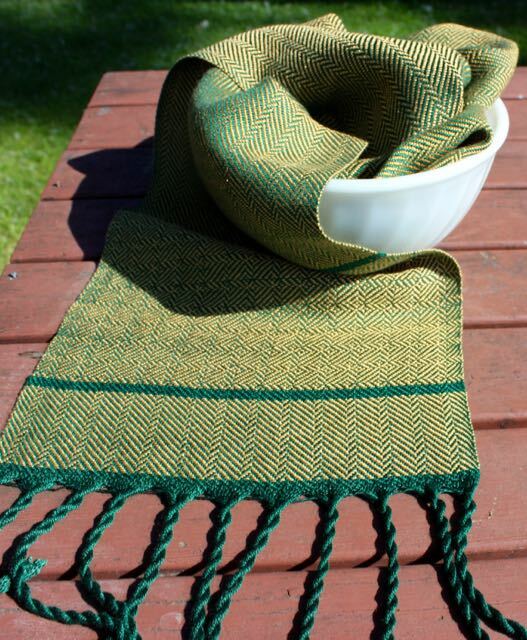 The fiber is Tencel, and the scarf has a nice sheen and drape, and twisted fringe. On the loom right now are a series of dishtowels (you know how I love dishtowels)! Lake Champlain is right outside that window! 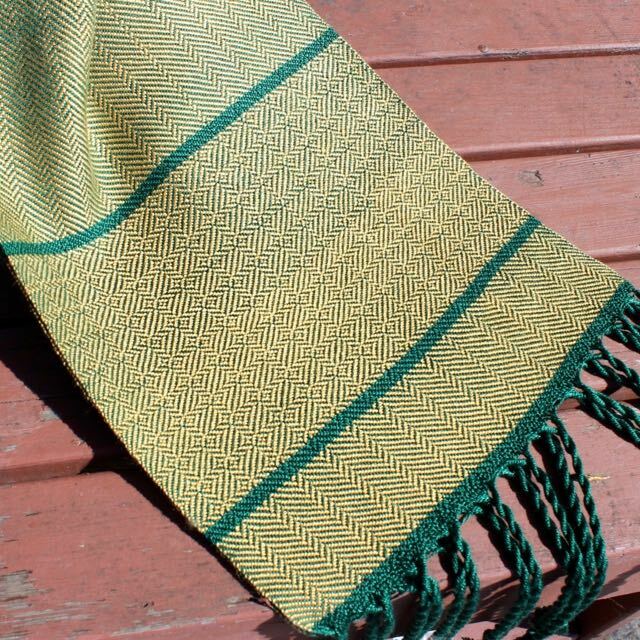 The weaving pattern for the towels is exactly the same as for the scarf—the herringbone plaid—but the fiber is a mix of cotton and linen. 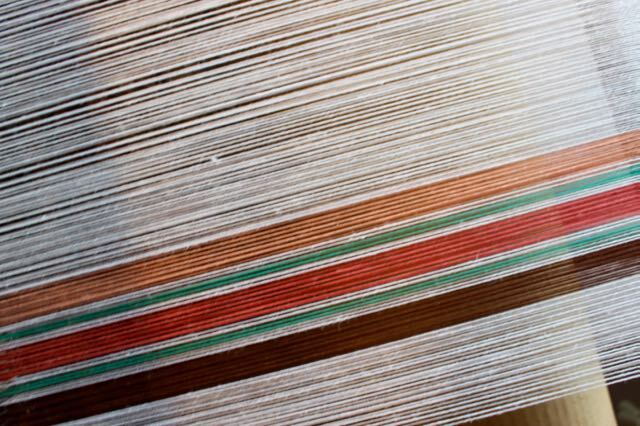 Isn’t it interesting how different the pattern looks, done in such different fibers and colors? So far, I’ve finished four towels and they’re all different. I like this one best, at least for now. I hope you’ll come back so I can show you how these turn out, and what comes next! Sometimes it seems to me that there are two kinds of people in the world. No, not early birds and night owls. Not “glass is half full” versus “glass is half empty.” Not progressives and conservatives. I’m talking about the folks who love shopping at garage/rummage/tag/yard/jumble sales and those who don’t. Some people just don’t get it—they don’t understand the thrill of the hunt. They don’t know the sense that, sometimes, you don’t know what you want until you see it, that treasures are waiting to be discovered. My mom and I get it. During summer, we go out “saling” a couple of days a week. We went out this weekend, too. Our range was limited because many of our usual haunts were still haunted by the specter of escaped convicts. We did NOT have a stellar weekend with lots of fabulous finds but we had a handful of very nice hours together and I got a few items that make me super happy. 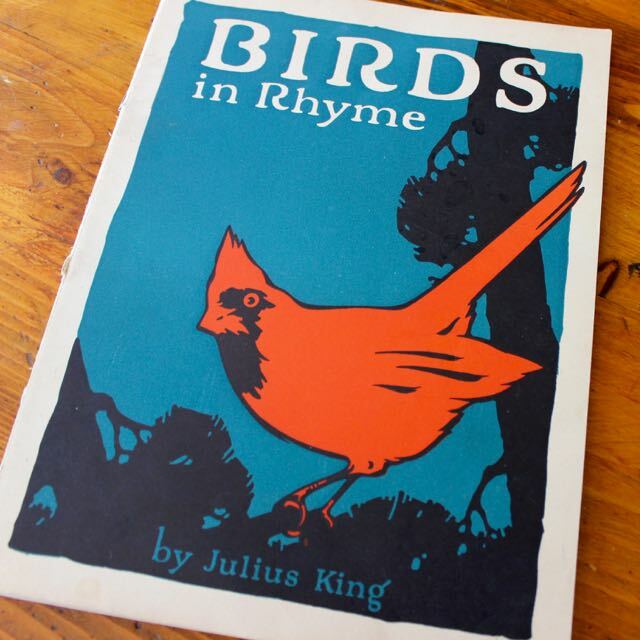 I love the illustrations in the book, colorful images of a number of birds of North America. 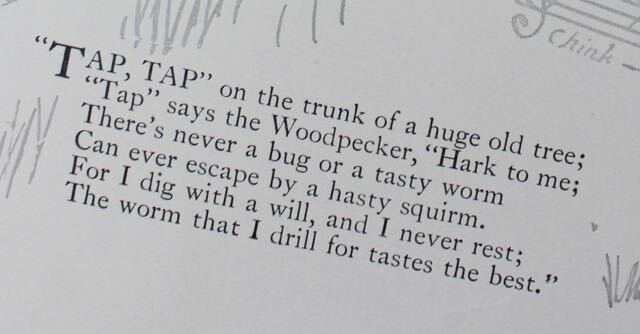 I love the poems that accompany each bird and summarize its traits. 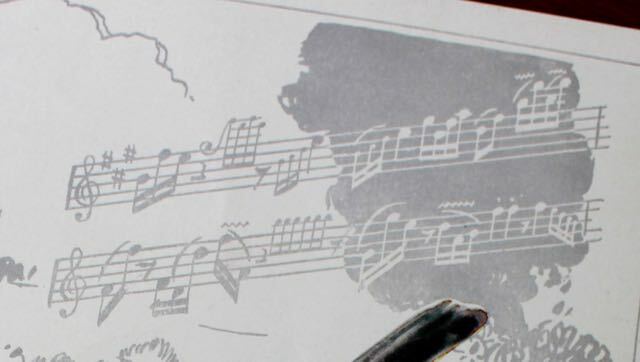 I love that the birds’ songs are conveyed by musical notes on a scale. I really love the cover, everything about it. I love the bright, saturated, complementary blue/green and red/orange. I love the stylized graphics in the Arts and Crafts style. 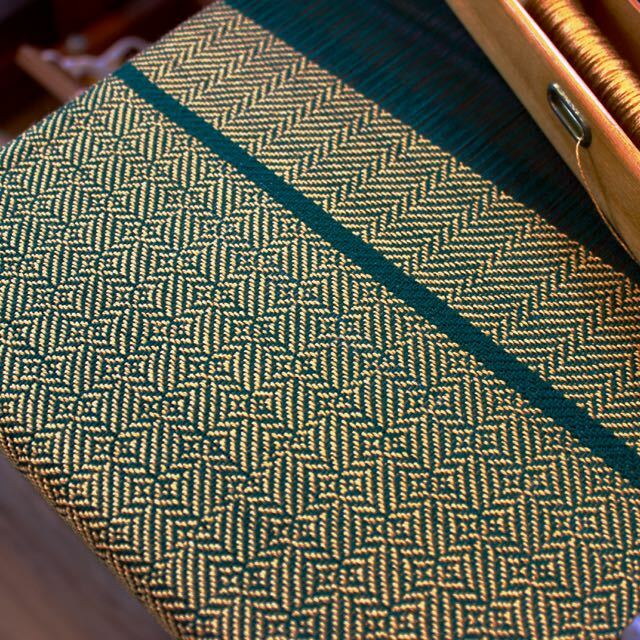 And I LOVE the fact that the cover just happens to match my husband’s current weaving project! This one-dollar purchase made my day! What else would give me so much for so little? So, where do you stand on the subject of garage sales? Do you get it? Or not? When I was a kid, I remember watching a sitcom on TV and a character, a bad guy, was bragging about the prisons he’d broken out of. He named Alcatraz and Sing Sing and then proclaimed, “Why, I even busted out of Dannemora”! I grew up on a farm about 8 miles away from the town of Dannemora, NY, the home of a New York State maximum-security prison. 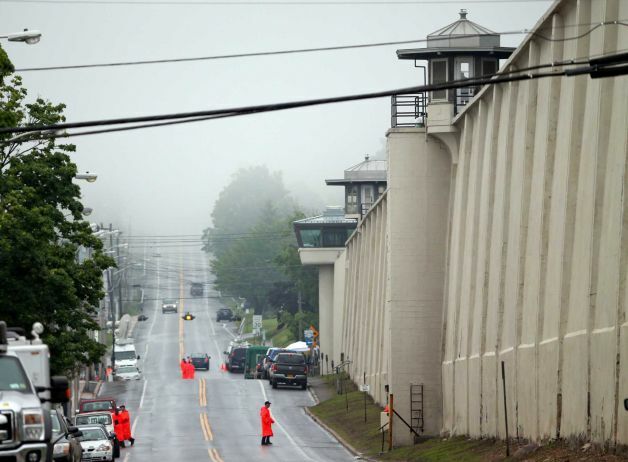 Now called Clinton Correctional facility, the walls of the prison dominate the tiny town of Dannemora, towering up one side of the main street. Some of America’s worst felons have made this prison their place of residence. As kids, we weren’t at all nervous about living so close to the prison. When we heard that TV character boast about breaking out of Dannemora, we just laughed because we knew NOBODY ever escapes from Dannemora. 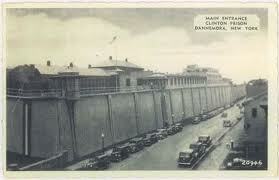 In the years since it opened in 1865, there had never been an escape from the maximum-security facility. Last Saturday, two convicted murderers made a kind of crazy, really bold, breakout from Dannemora. They are still at large and the world is kind of weird where we live. I now live about 25 miles from the prison but, since no one seems to have any real idea where the two men are, we’ve been locking the doors more carefully than normal. The woman who cuts my hair was late yesterday because she was stopped so officials could search her car. The ladies at the quilt guild meeting last night came from Dannemora and all the small towns along the way—Saranac, Cadyville, West Plattsburgh. They’ve been dealing with having their homes searched. By the time they went home, police were closing the road they would’ve traveled, because they had gotten a tip of men sighted. Schools are closed. People are told to stay inside but to leave their outside lights on. Everyone here knows somebody who works behind those walls, so rumors are flying. The human drama is intense. The escapees are scary, scary dudes, convicted of killing law enforcement officials and dismembering old men. Their escape plan was so elaborate and well-planned, we all figured they must’ve had help. And now the report is that a female prison employee may have been charmed, and used, by the men. She got cold feet at the last moment, the reports go, and didn’t show up with the get-away car. If this proves true, how humiliating for her family, her husband, the son who has defended her . . .
All of this has me thinking about how different news is when it affects us “up close and personal.” I am interested in news of other places but I admit that, the further away it is from me, the less real it seems. I have a hard time imagining, really understanding, the horror of a tornado tearing through that town in Oklahoma or a school shooting in Scotland or an earthquake in New Zealand. But then one of you writes about something that affects your world and I feel closer to the event . . . because I know you. I guess we all respond to this need to have events made, somehow, personal. So far, there’s been no present-day horror associated with this prison break. A lot of people are unsettled and there’s a lot of angst and uncertainty but no new violence. So far. We’re all paying attention to the news and keeping our fingers crossed that this ends as well as it can, with the men back behind bars, under close watch forevermore. Harriett was a maker, and a striver. We can’t say we know Harriett well at all but we do know one thing—whatever else Harriett was (Daughter? Mother? Wife? Nun? Maiden aunt? ), she was highly skilled with needle and thread. This pretty tray cloth was certainly not the first thing she ever made! It is fussy and not modern-looking at all, but I want you to appreciate the skill, and efforts, that went into it, a set of skills that are stunning by today’s standards. Even though you and I may never use these skills, we can still learn a lot from Harriett. So, let’s not think about the maker right now but, rather, the making. How was this tray cloth created? Harriett combined several skills with which many women of her era would’ve had at least some familiarity. First of all, she embroidered her tray cloth. The embroidery style she used makes me think of “society silk” embroidery that was all the rage, first in England, then in America, in the late 1800s and early 1900s. Society silk embroidery was done in single-strand silk thread; the embroidery, which was most often of flowers, was detailed and precise. The silk was available in hundreds of colors so the best society silk embroidery was subtly varied, highly detailed, and realistic. You could expect the backs of the embroidery to look as perfect as the front. 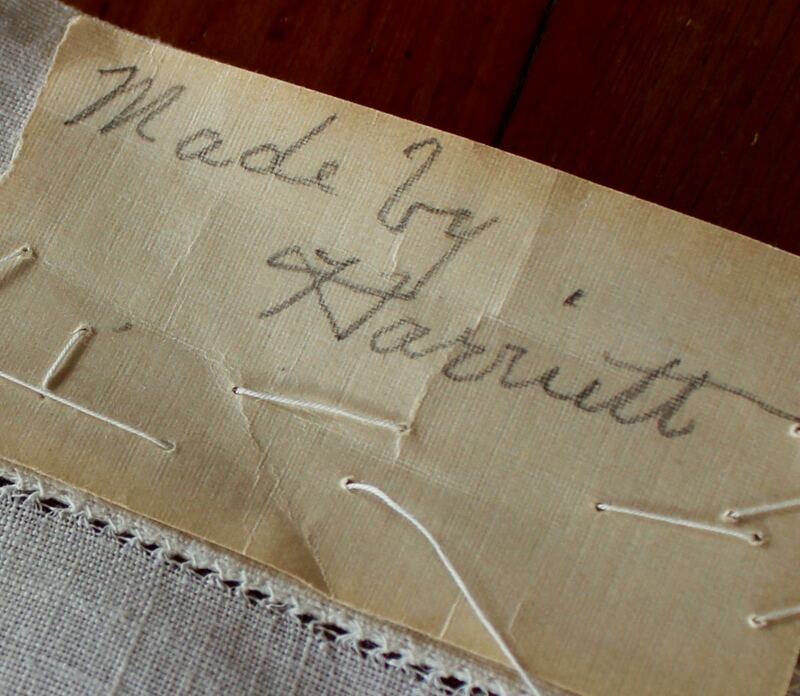 Harriett’s embroidery is clearly inspired by society silk. 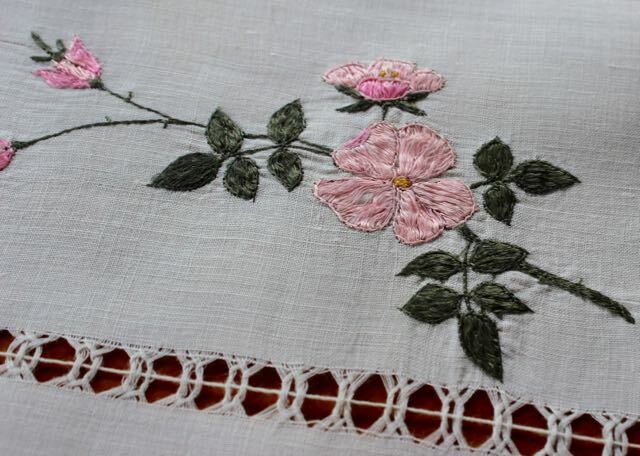 She worked in fine silk on fine linen, and used only two stitches, running stitch for outlines and satin stitch to fill in, as was common in society silk work. Harriett’s work does not match the highest level of skill you can find in this sort of embroidery—she doesn’t do a lot with subtle color shading and detail and the back of the work is a little messy—but the embroidery is delicate and finely wrought. 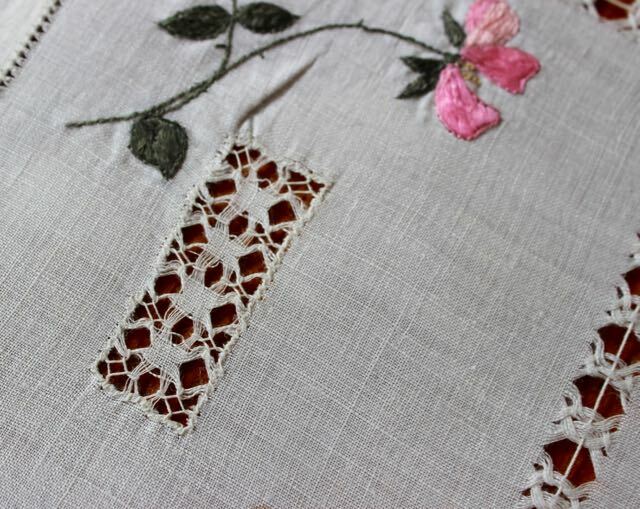 Another technique Harriett used, which really sets this piece apart, is the use of cutwork. 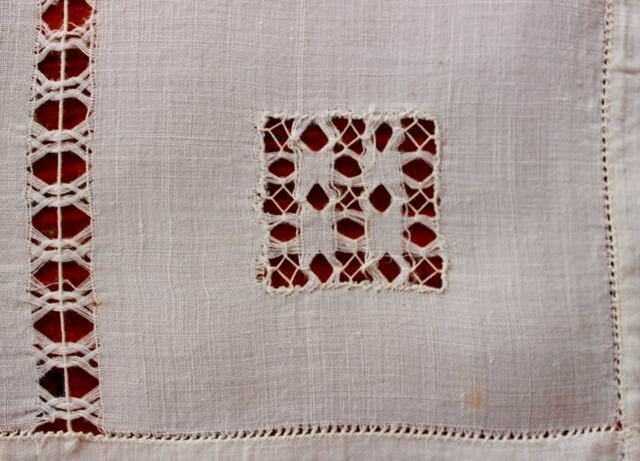 Cutwork can be fairly simple or extraordinarily complex but the basic principle is the same—certain threads in the woven linen are cut and removed from the fabric. 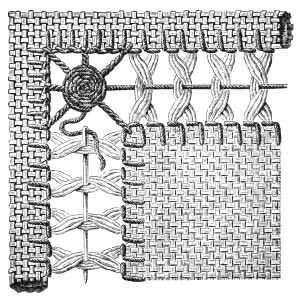 This would be easy to do in a rough fabric, like burlap, but I can’t imagine doing it the way Harriett did, in very fine linen! I did my best to count and found that this linen has about 70 to 80 threads per inch; each thread is finer than sewing threads you use today. 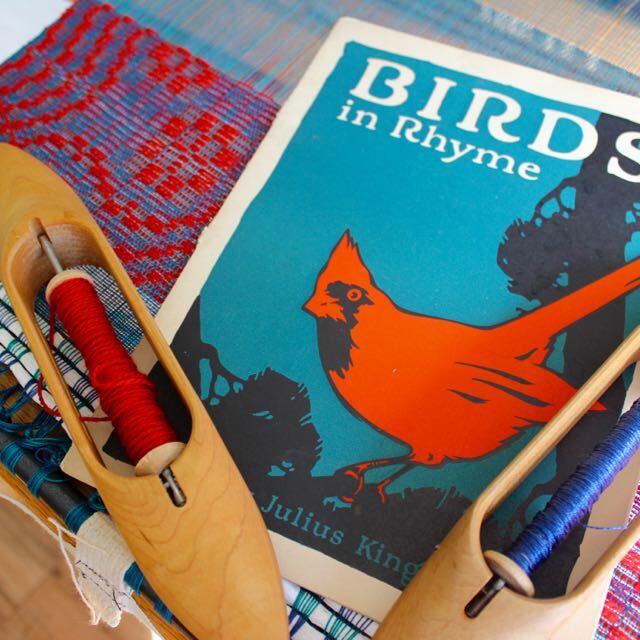 So, Harriett was carefully snipping certain threads, without cutting others, and gingerly pulling them out only, then, to introduce new threads back in, to create her patterns and stabilize the fabric. She used cutwork in several ways. 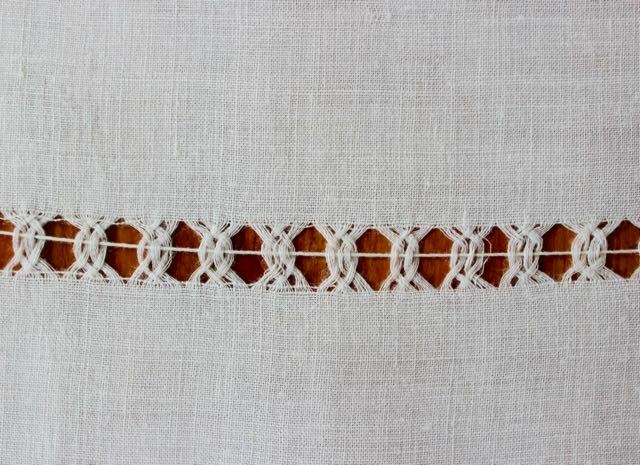 The simplest was the hemstitch she used. 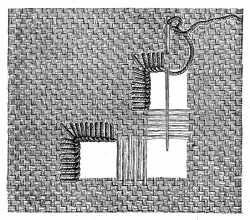 For this, she pulled out one or two threads around the edge of her piece, double-turned the hem up, next to the small line created by the drawn threads, and used tiny stitches to secure the hem and create a tiny ladder effect. Another, more complicated, skill was the open work that created the straight lines through the work. 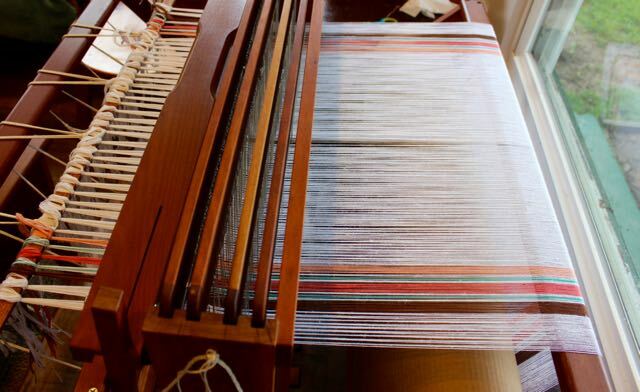 Here, a number of threads, probably 35 or so, were cut from the cloth and pulled out—basically a section of this delicate fabric was unwoven. 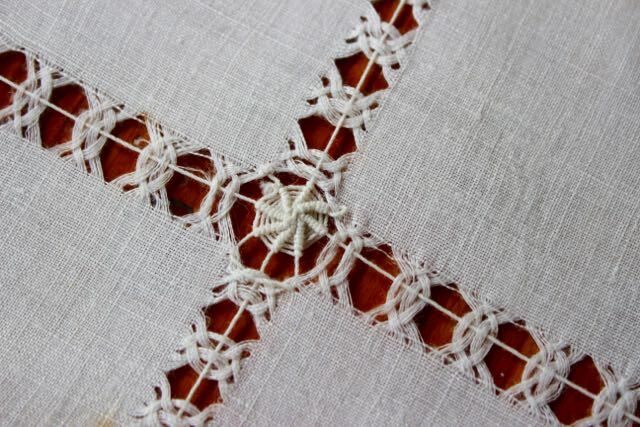 Then, a new thread was added, which was used to weave in and out of bunches of the remaining cross threads, to create a regular and intricate pattern. 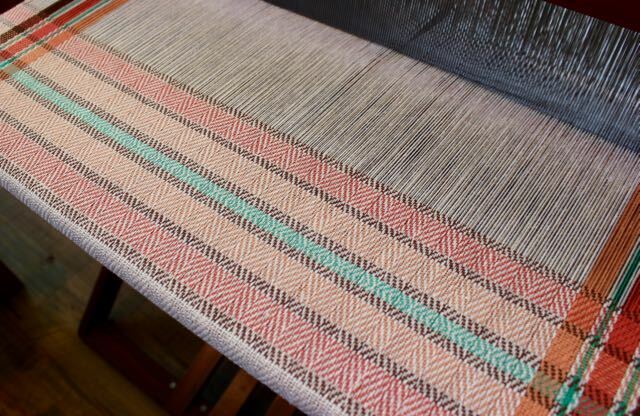 Harriett pulled out both horizontal and vertical threads in her piece, meaning the open areas crossed and basically created a section that was completely open. Here, Harriett has added “spiders.” She used the center threads she had added in the previous stage, to weave in and out of the bunches of threads. She treated these threads as spokes in a wheel and wove her thread around them, over and under, for the spider web effect. 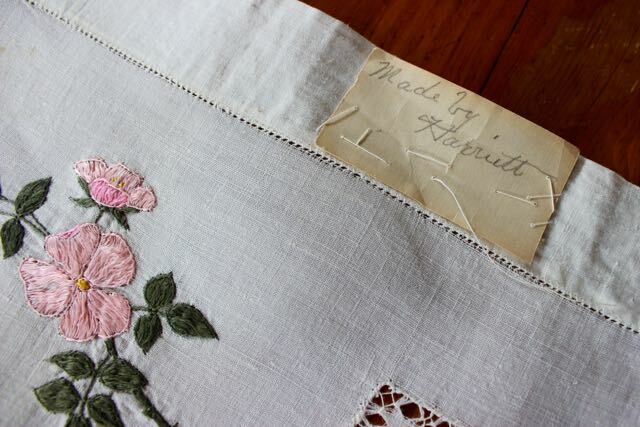 Harriett also used cutwork and drawnwork to create lacy areas in her tray cloth. In the square and rectangular areas of the cloth, she removed a lot of threads running in both directions, leaving only a few intact. She finished the outside edges of these boxes with infinitesimal buttonhole stitches, so they wouldn’t fray further, and then added threads to draw the remaining threads into a star-like pattern. Whew! That’s amazing work, Harriett! And to think, you did it entirely by hand, in sunlight or lamplight. Harriett’s work is excellent but, truly, it is not at the expert skill level achieved by some artisans. If you look really closely, you can see little mistakes and sloppy stitching. But who wants to look that closely?! After this time with her, Harriett feels like my friend and I cherish the work of my friends even more when I can see the imprint of their hands, and their humanity, in what they do. Harriett seems to me to have been a striver, someone who was testing her skills and pushing herself to a more intricate, more difficult level of work. She was building on work she had done in the past, to see where desire and persistence could take her. Harriett impresses and inspires me. 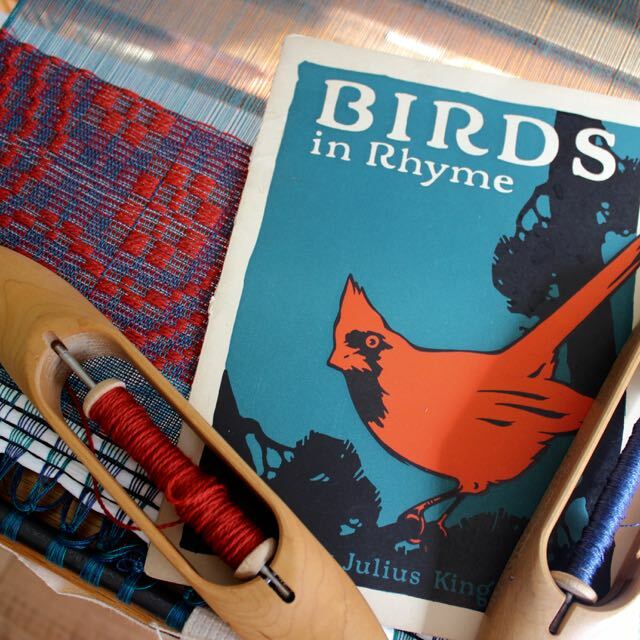 The work I’m engaged in, 100 years after Harriett put down her needle and thimble, is much different work. But the impulse to create, and to challenge myself, to grow and strive, is no different for me than it was for her. Thank you, Harriett, for reminding me that hard work and the joy of learning something new knows no age. * These illustrations come from the amazing Encyclopedia of Needlework, written by Therese de Dillmont in 1886 and available for free through Project Gutenberg. The diverting demands of the season have kept me from thinking new thoughts but nothing keeps the peonies from blooming again. I’ll re-post their pretty faces until I have something new to say!